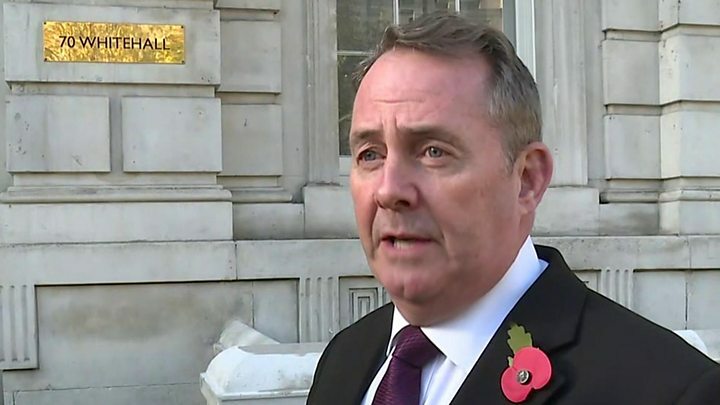 The UK must have the power to end any post-Brexit “backstop” customs accord with the EU on its own, International Trade Secretary Liam Fox has said. The Brexiteer said the UK had voted to leave the EU and “that decision can’t be subcontracted to somebody else”. The UK and EU want to avoid a hard Irish border after Brexit but cannot agree on how to do so. The EU has said it cannot agree to any arrangements which could be left unilaterally by the UK. Prime Minister Theresa May is keen to reach a withdrawal agreement with the EU this month. But her cabinet has been unable to agree on the mechanism for ensuring that there will be no return to border checks if a future trade deal is not ready in time. One option could be for the whole of the UK to remain temporarily aligned to the EU’s customs union, avoiding the need for customs checks at the border until a free trade deal is ready. But Leave campaigners want a clear exit strategy from any such arrangement. Earlier this week Simon Coveney, Ireland’s foreign minister, tweeted that “a backstop that could be ended by UK unilaterally would never be agreed to” by Ireland or the EU. In Paris earlier, Foreign Secretary Jeremy Hunt said negotiations with the EU were “in the final stage” and he was confident an agreement could be reached. Mr Coveney told the Irish Canada Business Association conference in Dublin: “I would urge caution that an imminent breakthrough is not necessarily to be taken for granted, not by a long shot. Although 95% of a Brexit deal is said to be agreed, the backstop remains a sticking point. It is effectively an insurance policy that would only be triggered if a future trade deal is not in place by the end of 2020 – or if this final deal does not ensure a “frictionless” border. If a Brexit deal is agreed between the UK and the EU, it then has to be approved by the House of Commons and the remaining EU member states. Earlier, former Brexit Secretary David Davis, who quit the cabinet over Mrs May’s Brexit plan in July, told the BBC that defeat in the Commons for the current plan was “looking like a probability”, especially if MPs were not shown the full legal advice on the Irish border backstop plan.